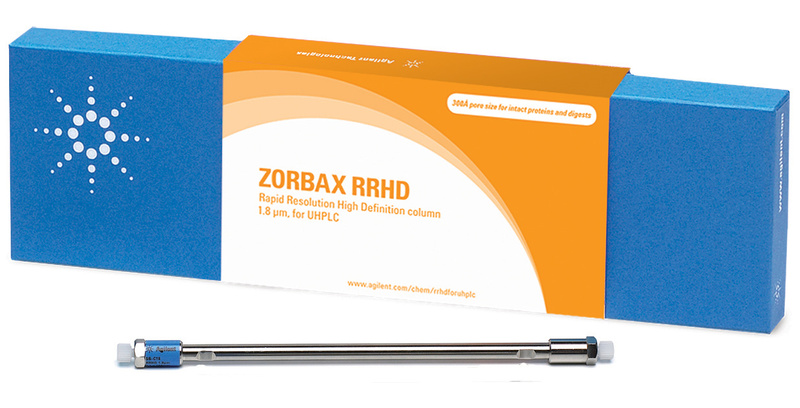 Agilent Technologies Inc. (NYSE: A) recently announced it has expanded its family of sub-2 µm particle 300 Angstrom pore columns for reversed-phase liquid chromatography with rapid-resolution, high-definition ZORBAX 300SB-C3 and 300-Diphenyl 1.8 µm columns. The columns extend the benefits of reversed-phase biomolecule separations to ultra-high-performance liquid chromatography (UHPLC). The C3 phase broadens the selectivity and improves peak shape and recovery options for larger proteins, including antibodies. The diphenyl phase offers additional selectivity through pi-pi interactions with aromatic amino acids in the primary structure. "Agilent now offers the broadest range of sub-2 µm, wide-pore biocolumns for reversed-phase liquid chromatography," said Agilent product manager Linda Lloyd. "The new 1.8 µm columns add to the scalability of the ZORBAX family of C18, C8 and C3 phases already available with 3.5 and 5 µm particles. We're pleased to bring this higher order characterization and increased speed to UHPLC users." The 1.8 µm particle size and 300 Angstrom pore size bring UHPLC efficiency, resolution and robust quantitation to reversed-phase protein separations. Additionally, the columns are stable up to 1200 bar. Agilent's proven StableBond technology for the C18, C8 and C3 columns, and the end-capped diphenyl with Pursuit chemistry, deliver symmetrical peaks - even at low pH - when using trifluoroacetic or formic acid mobile phase modifiers. Column life is not compromised. The full ZORBAX rapid-resolution, high-definition family now includes 13 phases for small molecule applications, including HILIC, and four phases for large molecule separations. This broad range of options enables chromatographers to optimize their UHPLC separations with selectivity refinements. In addition, RRHD's 1200 bar stability provides increased flexibility with flow rates and mobile phase selection. For more information, visit www.agilent.com/chem/biohplcproteins.